Hours of rolling around in bed and getting up in the morning with back pain – that’s how many people sleep and lie down. But this has nothing to do with rest and healthy sleep. When you regenerate overnight, it’s not the hours you spend in bed that count – but how restful sleep is for body and soul. In short: Sleep is not the same as sleep – and only an individually suitable sleeping environment ensures healthy, restful and above all pain-free lying. 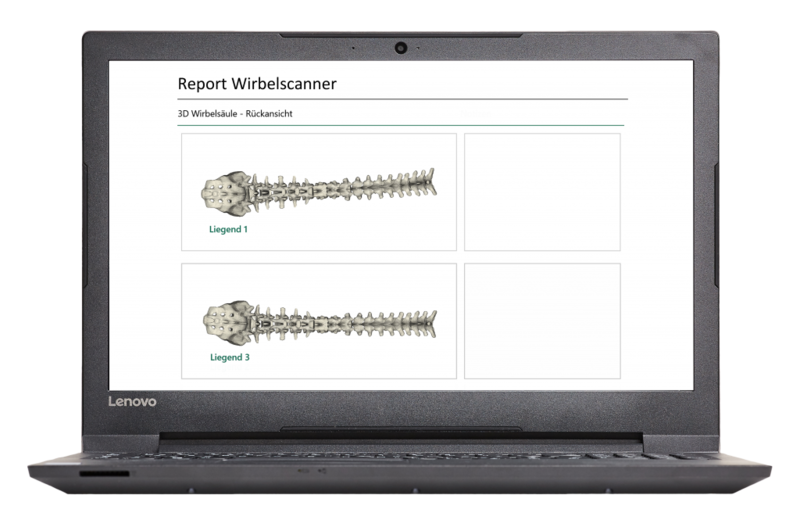 Radiation-free, risk-free and pain-free, the small hand-held scanner transfers the scanned spinal column data to the software and a specially developed algorithm converts it into clear and comprehensible images. The SPINESCANNER® is a handy, radiation-free measuring device that displays three-dimensional images of the spine with medical precision. The SPINESCANNER® adapts to the personal contours and determines the shape and mobility of the spine, as well as data on back length and pelvic position. During the measurements, images are generated which clearly show the individual shape of the spine when standing and lying down. By comparing the standing and lying measurements, it is immediately apparent which mattress offers the appropriate support and relief. Every progress in the adjustment of the slatted frame, mattress and pillow can be followed live on the screen. The SPINESCANNER® is manufacturer-independent – this means that the measurement is not aimed at selling mattresses from a specific manufacturer, but rather the mattress that fits exactly, regardless of which manufacturer it comes from. The measurements, including evaluation, take place in real time and take only a few minutes. The SPINESCANNER® is currently by far the most accurate and easiest way to find the individually best fitting mattress! The most important thing about healthy lying and a good night’s sleep is the mattress on which you make your bed. Mattresses are offered on the market like sand by the sea – but which one is the right one is not just a matter of taste or the seller’s recommendation, but simply a matter of personal anatomy. The SPINESCANNER® was developed in order to discover the peculiarities of these, to make them visible and to select the right mattress accordingly. A healthy back is the be-all and end-all. Pain-free through day and night – this only works if the spine can regenerate during sleep. With the help of the SPINESCANNER® the professional can recognize within few minutes, which form the spinal column has – and express accordingly recommendations for mattresses, which support and relieve the movement apparatus at night ideally. Of course, this is not possible and would cause other health problems – however, it is clear that the lying spine should look like the standing spine. This can be supported by an appropriate mattress – but first a standing measurement of the spine must be carried out with the SPINESCANNER® and then a lying measurement. On the display, the consultant together with the customer can see exactly on which mattress the image of the spine is most similar when standing and lying down. The customer feels this immediately on the matching mattress – and feels comfortable from the very first minute. Thus it receives exactly the mattress, which it needs for correct lying and avoids false purchases – to it an objective proof is supplied that it is optimal for its healthy sleep. With the conventional test couches the customer is already overtaxed after few mattresses and cannot understand the difference between the 2. and the 10. mattress any longer.